On one side of the room loyalists noisily pledge allegiance to the British Crown. On the other side of the aisle American patriots of New York with equal passion express their yearning for independence from the monarchy. A row of disenfranchised slaves and landless laborers – virtually voiceless in the back of the room – feebly plea for the deeply divided factions to consider their concerns when they come to some consensus from the midst of their contentiousness. Today, however, the underclass has had enough. After their proposal to join a colonial army is shot down, they become a frustrated, angry mob. It storms the patriot-leaning presiding officer of the divided house and – with one fateful roll of a six-sided die – “kills” him. Then, with a new loyalist-leaning speaker at the helm, British loyalists offer a deal to the slaves of American revolutionaries: Emancipation, but only in exchange for joining the royal forces. It’s a dilemma that puts the patriots in a tough spot. Moreover, it’s a moral quandary that forces Brenau students who make up players in all factions of the debate to reevaluate not only their perspectives on the American Revolution, but also any pre-conceived notions about some of the major issues in U.S. history and evolution of political philosophy. On this day in the recently concluded academic year, they participated in another segment of the Reacting to the Past program that in the past four years has provided an innovative method of students’ learning intimately about some historical event or significant issue by figuratively experiencing it through well-researched role-playing and reenactment. For example: from that formative period in American history, fueled by the quest for individual freedom and strong, simple declarative language like “all men are created equal,” how is it that we formed a country that would still allow slavery for the better part of a century? Did the end of forming the United States justify the means of the deal-with-the-devil compromise that seemed necessary just to get it done? To be clear, no actual killing of politicians occurred during the scene above. Brenau’s chief evangelist for the teaching and learning methodology for the Women’s College honors curriculum, RTTP as it is called, has been art professor Mary Beth Looney. Looney “retired” at the end of the spring 2016 term after 20 years at Brenau to move with her husband to Italy, but the program now has many converts. Looney presided over dozens of role-playing games similar to the one described earlier in the last four years. During the multi-week courses, students take on character roles and, with the help of real-world documents and other sources, debate their way through significant and often contentious historical events. The programs have focused on a wide array of issues, such as the early 20th century women’s suffrage movement, India’s quest for independence in the 1940s and the Antinomian Controversy that shook New England in the 1600s. Early in 2015-16, a variation of the game revolving around the 1960s Civil Rights Movement took place in first year seminar classes for Women’s College freshman, all of whom were required to read U.S. Rep. John R. Lewis’s graphic novel-like memoir of his days in the movement leading up to the pivotal march on Selma, Alabama. In today’s high-tech, globalized society, it can sometimes be difficult for students to grasp certain historical contexts. Thanks to an inventive role-playing program, however, Looney says that Brenau University students aren’t just learning about things like the Revolutionary War and the Civil Rights Movement – they are “living them” in the classroom. Brenau Vice President of Student Services Amanda Lammers said about 180 Women’s College newcomers participated in the role-playing sessions, which took up about half of the fall 2015 first-year seminar course. 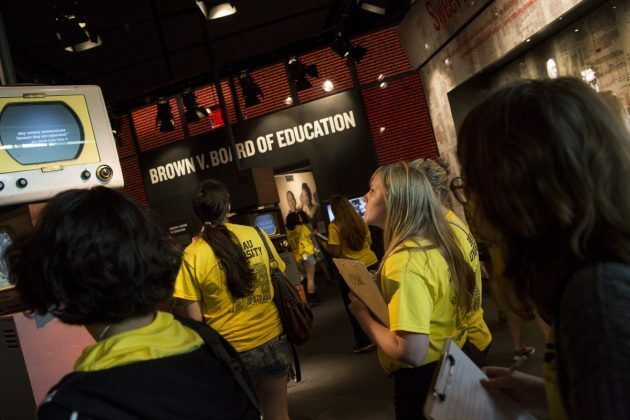 The module tied into the seminar’s overarching civil rights movement theme, which also included a trip to the National Center for Civil and Human Rights in Atlanta and readings. In the programs, Looney said professors are transformed from “the sage on the stage” to the “guide on the side.” Assuming the role of “game master,” the instructor takes a hands-off approach and lets the students themselves steer the class discussion – just as long as they do not introduce anachronisms into the game, like Paul Revere’s making his famous midnight ride on a motorcycle or Abraham Lincoln’s giving the Gettysburg Address via Twitter. Looney said that students become very engaged in RTTP modules, with some even coming to class in full period regalia. By allowing undergraduates to “own” the learning experience, she says students walk away from the games with a more nuanced understanding of complex material and a greater desire “to seek mastery of a subject.” In her view, the program both stirs the curiosity and passion of students and boosts their public speaking, presentation and debating skills. She says she has been moved to tears by some in-class speeches, many delivered by students who initially exhibited a lack of confidence when the games began. As a professor, she says she enjoys the course because she never knows what awaits her when her students take over the classroom. The “learn-as-you-play” model, she says, isn’t just suited for history and political science courses. In an arts class this semester, for example, Looney is using a game that lets students explore the shift from hunter-gathering cultures to agricultural systems. Similar modules, she says, could just as easily be implemented in any number of STEM courses. Instructors, Looney states, gain just as much from the programs, since the games inspire them to reconsider their educational approach and think more carefully about how they advise students.